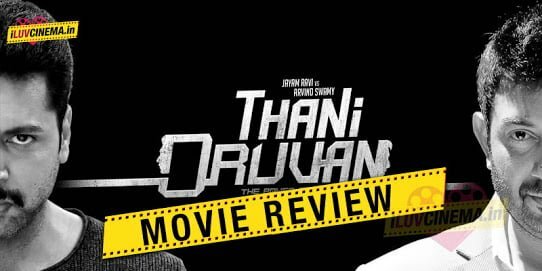 With a head-turning starcast and good production values, Thani Oruvan comes off as a well written mind game thriller which works, despite its shortcomings in narration clarity. After taking some time for character establishment, Thani Oruvan shifts to the undercurrent between the protagonist in Jayam Ravi and the antagonist – Arvind Swami. Raja knits together a screenplay which begets more brain than brawn. The seesaw keeps swaying as the hero breaks down the villain and vice versa. Though the director keeps the clock ticking by throwing in surprises at regular intervals along with comedy and romance, the mixing feels inappropriate at some point. However, what helps you sit through Thani Oruvan is the amount of data and the new-age feel that the director successfully embeds within. Films like this need a solid cast and Thani Oruvan is lucky to have that. You get to see a Jayam Ravi who is very comfortable in the role of a honest cop, but you cannot help but recall the sincerity he portrayed in Nimirndhu Nil. Arvind Swami is uber cool as the villain, flowing in with his swaggy dialogue delivery. It is indeed a classy comeback for the actor who is very choosy about his films. Nayanthara has a solid part to play, along with the supporting actors like Ganesh Venkat Raman and Harish Uthaman who all have equal weightage in the script, barring Thambi Ramaih who goes off track in an attempt to tickle the funny bone. Ramji’s camera drafts in some lovely visuals, with a special mention to the beach song in Kannala Kannala. Hip Hop Tamizha’s songs do the trick, but the BGM is heavily repetitive with cues belonging to the same genre. The runtime of 160 minutes is a slight worry too. Smart is the word for this film which crosses the par line, thanks to the cerebral route which Raja takes to tell his story. There might be a lot of obstacles on the way but Jayam Ravi and Arvind Swami prop this up, along with a handful of memorable scenes which make it an engaging fare.